They are repeating the common misconceptions that have been passed down for years. It has been proven that carp aren't the villains they are thought to be. The print edtion of NACA magazine from a couple of years back. There is no date on the magazine but it has a nice sunrise/sunset picture on the cover and an article on the history of carp. 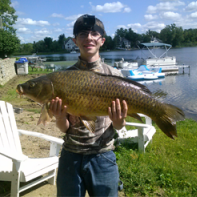 The article addresses the myths surrounding the common carp. Anyone have any information on the date of the magazine? Any copies available for this person? Want to keep mine for reference.